Arsenal anniversaries 14 April. Our headline comes from 2001. 14 April 1894: Tommy Bryan played his last league game of the season against Burton Swifts a 0-2 home defeat. At the end of the season he left the club and later played for New Brompton and Dartford. There’s no evidence he played for Royal Ordnance Factories as suggested in some reports. This was also the last game for Joseph Cooper. 14 April 1900: Ex Arsenal goalkeeper Charlie Williams scored for Manchester City against Sunderland – the first ever league goal recorded as being direct from a goal kick. 14 April 1903: Arsenal started a run of four post-season friendlies to round off the season – this one against Northampton Town. Arsenal won 1-0. 14 April 1914: The Times reported that Arsenal had changed its name although this did not happen until the club became The Arsenal Football And Athletic Company Limited sometime between 20 and 23 April. The Board publicly changed the name on 23 April, but did not formally approve the change until 10 May 1915. 14 April 1919. Athletic News published the Sir Henry Norris complaint about the London Combination handling of the Victory Cup match. Norris resigned from Fulham as a director for the second and final time (date unclear but certainly between 11 April and 21 April 1919). 14 April 1919: Arthur Hutchins and Ernie Williamson signed from Croydon Common. CC were the only Southern League team not to return after the first world war, and although the details are unclear it seems Henry Norris may have had some involvement with the club. 14 April 1923: John “Alex” Mackie played his first international for Ireland at the age of just 20. He was however forever condemned to be known for the false story about demanding a monkey as a signing on fee. He was actually very talented and played over 100 games for Arsenal. 14 April 1933: Despite winning the league Arsenal only got one 60,000 crowd in the season – on this day for Arsenal 4 Sheffield W 2 (Hulme 2, Lambert and Bastin). Arsenal scored 13 goals in the first three league games of April. 14 April 1934: Arsenal Reserves v Watford Reserves was advertised as “Admission 7d (including tax).” Less than half a penny in 2019 prices and money. 14 April 1934: Frank Moss made his international debut. When Arsenal bought him he was a reserve goalkeeper for second division Preston, yet he went on to play in the three consecutive title winning seasons. 14 April 1936: George Swindin signed by George Allison for £4000 from Bradford City. He won the league with Arsenal in 1938, 1948 and 1953 and subsequently went on to be Arsenal’s manager. 14 April 1937: Manchester City played their game in hand and beat Sunderland 3-1. For Arsenal to win the league, City who had not been defeated since Christmas now had to lose two games out of the last three, while Arsenal had to win the lot. 14 April 1958: Geoff Strong turned pro with Arsenal. He started playing with the first team in 1960/1 scoring ten in 19 games in his first season. He played 125 games before being transferred to Liverpool where he became a focal point in their team. 14 April 1959: Birmingham 4 Arsenal 1. With seven without a win, all thought of the championship had gone, although by winning the remaining three games Arsenal came third and would not come higher until 1971. DR Clapton scored the goal. 14 April 1964: John McClelland’s final appearance before moving on to Fulham. He was replaced by McKechnie and Furnell. John tragically died of a brain tumour aged 35. In all he played 46 league games for Arsenal. 14 April 1973: Arsenal 1 Tottenham 1. 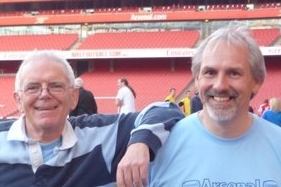 Peter Storey scored and the result left Arsenal in second two points behind Liverpool. But draws in the next two games saw Arsenal slip away from the title and ultimately they won only one of their last six of the season. 14 April 1979: West Bromwich Albion 1 Arsenal 1. Attendance: 28,353. This was part of a run of nine games in 34 days as Arsenal approached the FA Cup final, Only two of those games were won – against Tottenham and Chelsea. 14 April 1991: Arsenal lost to Tottenham in the FA Cup Semi-final at Wembley 1-3 with Gascoigne and Lineker doing the damage. Smith scored for Arsenal. But most attention was on winning the League while losing only one game all season. 14 April 1999: Man U 2 Arsenal 1. FA Cup semi-final replay. Bergkamp scored but at the end Schmeichel saved a Bergkamp penalty and Man U raced to the other end to score the winner. 14 April 2001 Arsenal 0 Middlesbrough 3. The last match until 30 November 2003 in which Arsenal failed to score at Highbury. However on this day both Silvinho and Edu scored own goals!